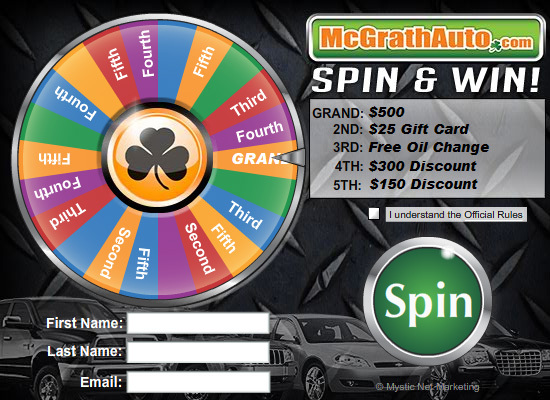 For automotive lead generation from the current advertising initiative, the car dealership offers potential customers a chance to play and to win prizes and or coupons from their Virtual Prize Wheel located on their website. The leads generated from players are then used for follow up and online email marketing campaigns. This will engage future customers in a fun way while generating new business. Your dealership has website visitors coming and going all day long. The Virtual Prize Wheel will let you know they were there! 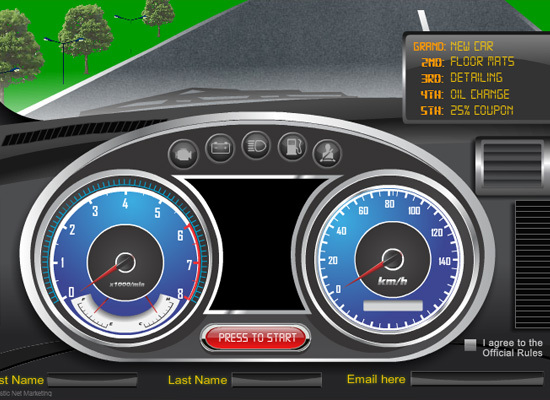 Virtual Prize Wheel marketing is simple, effective and measurable. Not only could you use it to drive customers in, but you could use it as a Sales Incentive. This will increase the productivity in your sales people. The sales person that sells the most cars gets a chance at spinning the wheel. Idea Note: Offer a single large prize over a long promotion period. Offers may include coupons valid towards a purchase, service, parts and accessories.